A lovely wood-beamed interior with fireplaces and beautiful exterior garden. 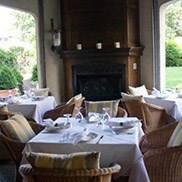 The restaurant is old school Indian ambiance with a great patio. The food is presented well and was good, not great. Overall a good experience.